Sanibel Island in Florida offers a breathtaking reprieve for families who want to get away from the hustle-bustle of everyday life. Here you'll find shell-strewn beaches, a laid-back vibe, terrific restaurants and shops, and an incredibly diverse wildlife sampling. A jaunt down the beach or a bike around the island makes for wonderful take-home memories. And while you won't find theme parks or children's museums to keep your kids entertained, instead, give them the opportunity to spot dolphins, hold small sea creatures, and kayak through the mangroves. These encounters trump a trip to Disneyworld any day. 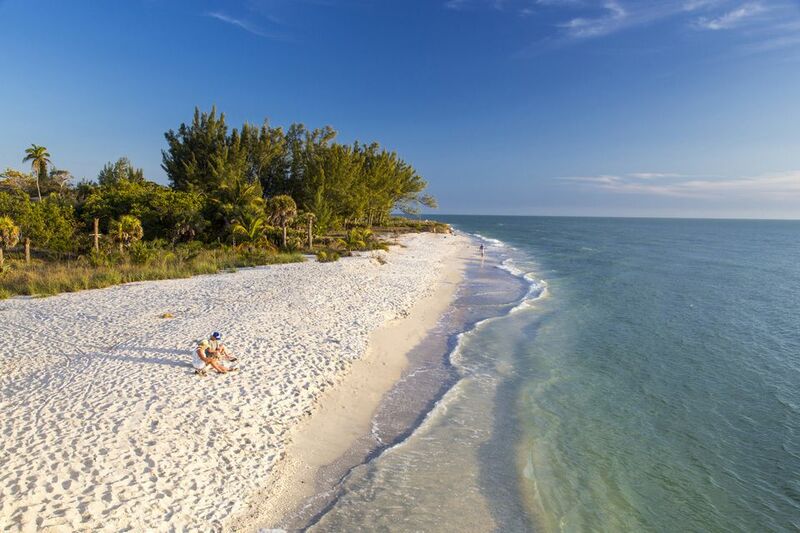 With beaches that boast over 60 different kinds of seashells, Sanibel Island is a shell hunter's dream. Kids will find themselves immersed for hours in this natural treasure hunt—without a care given to the backbreaking stance known as the "Sanibel stoop." Warm Gulf waters and calm surf make most of the island's beaches great for families with small children. Come at low tide or after a storm to find conch, junonia, lightning whelk, and cockle shells. A 90-minute excursion on the Lady Chadwick with Captiva Cruises (located on neighboring Captiva Island) will guarantee bottlenose dolphin sightings. See these marine mammals leaping and frolicking in the waters of Pine Island Sound. Along the way, a naturalist will point out local sights and landmarks while answering questions about wildlife and island history. As a bonus for families, the captain usually invites kids to steer the boat and take a photo with him in his captain's cap. With over 25 miles of paved, carless trails, Sanibel Island is a wonderful place for families to explore on two wheels. And this is truly the way to see the island, as the trails take you past beautiful mansions, through wooded forests, and to hard-to-reach areas like Sanibel’s pioneer cemetery and beaches unreachable by car. Several outfitters like Billy's Rentals, Finnimore's Cycle Shop, and Tarpon Bay Explorers rent bikes, tandems, pull-behind child trailers, and even canopied surreys. So get the whole family involved, even if they're too young to pedal. Budding marine biologists will love the acclaimed Sanibel Sea School, offering daily and weekly programs that teach kids about marine conservation. With themed activities and hands-on experiences, children ages 6 to 13 can foster their love and appreciation for the ocean. Each day includes surfing, art, group-bonding activities, all while integrating subjects like fiddler crabs, wading birds, and sea turtles. Sign up in advance because space is limited to 24 students per day. Kayaking through a mangrove swamp is a must-do activity while visiting this Florida island. Tarpon Bay Explorers offers canoe and kayak trips in the J. N. "Ding" Darling National Wildlife Refuge where naturalist guides give you an up-close experience with this unique ecosystem. See alligators, raccoons, otters, and hundreds of different kinds of birds in this 6,300-acre wilderness. Paddle through mangrove swamps and winding waterways, and then keep your kayak for free for the remainder of the day. A stop at Pinocchio's Italian Ice Cream (362 Periwinkle Way) is a Sanibel tradition. The kitschy shop at the east end of Sanibel is legendary for its delicious homemade Italian gelato. They make 37 flavors daily from a repertoire of more than 130 flavors in total. And whether you order a cone or bowl, every serving is topped with an adorable little animal cracker. Since 1884, the Sanibel Lighthouse (or Sanibel Island Light), has stood on Point Ybel at the eastern tip of Sanibel Island, marking the entrance to San Carlos Bay. And the "lighthouse" isn't really a house at all but is actually a tower. While you can't exactly access the light, the site itself features a great shelling beach, a fishing pier, and a nature trail. Kids will enjoy learning about the history of the lighthouse and no trip to the island is complete without a selfie in front of it. Get there early, as parking spaces fill up. There are few places on the East Coast of the United States where you can revel in a western sunset. But Sanibel Island, which faces due west in the Gulf of Mexico, is one of them. Depending on the time of year, Sanibel's sunset locales vary. In the winter, catch both sunrise and sunset on the southerly beaches. But in the spring and summer, the northern beaches are where it's at. Turner Beach, in particular, is known for its spectacular sunsets. But heed the warning signs, as the bridge makes for swift ocean currents and the water around it is not advisable for swimming. Can't tell an angel wing from a glassy bubble? Well, a visit to the Bailey-Matthews National Shell Museum will set you straight. The museum features over 30 permanent exhibits on shells of Sanibel and Captiva Island, as well as those from around the world. Their learning lab is a great place for children to engage in hands-on play with displays, games, a tank with indigenous mollusks, and continuously-playing children's videos. If you're looking for untouched beaches, hop a ferry to Cayo Costa State Park with its nine miles of pristine sand, pine forests, oak-palm hammocks, and mangrove swamps. While there, take a swim, snorkel, or book a ranger-led kayak tour or hike. If you're lucky, you may see manatees and pods of dolphins in the waters. The ferry terminal is located on neighboring Captiva Island and accessed via a short drive over the bridge. Yolo Board Adventures Sanibel offers two-hour guided eco-tours for both adults and children 12 and older. The tour takes you across the flat waters of local estuaries and waterways and offers beginner instruction for those new to the sport. A good day on the water promises dolphins, manatee, and other sea life sightings. The tour price covers the rental of all gear, including a PDF, leash, tie-downs, and fresh drinking water for each person. Corrie P. / CROW - Clinic for the Rehabilitation of Wildlife, Inc.
At the Crow Clinic Animal Rehab, kids can interact with animal ambassadors for a remarkable learning experience. Compare native and invasive species of reptiles; hang out with a red-tailed hawk; play hide and seek with a bashful opossum. You can also watch a live video feed of behind-the-scenes animal rescue and care. Visiting this locale is a feel-good endeavor, too, as your admission fee goes towards the care of approximately 3,500 injured and orphaned animals each year.